Judging from Vikings-based Twitter on Sunday, fans were bathing in the luxury of New Orleans’ bitter misfortune. Welcome to the Monday edition of The Cooler, where schadenfreude is the Minnesota equivalent of winning the Super Bowl. Let’s get to it. Any NFL season that advances far enough that the Vikings are no longer playing while others still are — so basically, every season in almost my entire lifetime, given that I was 2 months old the last time the Vikings played in the Super Bowl — offers fans of the purple a lot of “lesser of two evils” propositions when picking a side to root for in a playoff game. So many teams have wronged the Vikings over the years that my best friend since age 12 wrote a book about it a decade ago and it is in urgent need of an update. Usually, there’s a dilemma. In the wild card round, did you at least passively root for the Seahawks (Blair Walsh game!) or Cowboys (Drew Pearson!) when they met? That said, there are a few teams in the NFC that it’s hard to muster up too much hate for if you are a bitter and angry Vikings fan. And the Rams are one of them. The Vikings are 5-2 all-time against the Rams in the playoffs. Even if you’re bitter about how the greatest show on turf knocked the Vikings from the 1999 playoffs with a 49-37 victory, you probably understand that the outcome was justified and earned. The Saints, though, still hold a villainous place in Vikings’ fans hearts for the events of the 2009 season — Bountygate and the brutality unleashed on Brett Favre in the NFC title game, one of the most painful what-if games in purple history. Rooting interest in Sunday’s NFC title game, then, was easy. You might think that last year’s Minneapolis Miracle squared things. Maybe that would have been the case if the Vikings had gone on to win the Super Bowl (narrator: they did not). 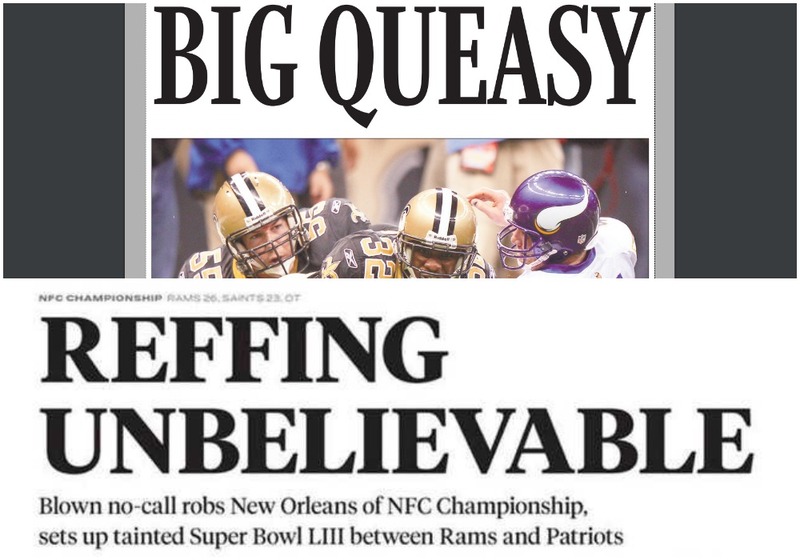 Judging from Vikings-based Twitter on Sunday, though, fans were bathing in the luxury of New Orleans’ bitter misfortune after the Saints experienced their own haunting what-if moment in an overtime loss in the NFC title game to the Rams. In this case, it was a blown non-call on a pass interference penalty with the Saints and Rams tied late in regulation. Had officials thrown a flag, New Orleans would have had first and goal with the chance to either score a touchdown or milk the clock for a chip shot field goal with very little time left. Instead, they kicked the go-ahead field goal with plenty of time left for the Rams to equalize — which Los Angeles did, before winning in overtime. Payton also said his team will “probably never get over it,” which is a sentiment Vikings fans know all too well. Saints fans probably aren’t in the mood to be reminded that despite the bad call the Saints could have still clinched the win with one defensive stop … and that New Orleans did get the ball first in overtime, where a touchdown from its high-octane offense also would have sealed the game. Similarly, Vikings fans often gloss over Minnesota’s bungled opportunities nine years ago — and Favre’s awful decision — and head straight for the “we were robbed” chorus. In any event, misery loves company. And Vikings had a whole lot of love for the Saints’ misery on Sunday. *Derrick Rose was tremendous for the Timberwolves on Sunday, bailing them out in a 116-114 victory over the lowly Suns with 31 points off the bench — including the game-winning jumper with less than a second left. On the flip side of that equation, Andrew Wiggins had another wretched game offensively, scoring just 10 points on 3 of 14 shooting in 40 minutes (while also failing to register an assist, steal or blocked shot in all that time). Since going for 40 points and 10 rebounds in Ryan Saunders’ first game (while also making 16 of 18 free throws), Wiggins in his last five games is averaging 14.8 points on 35.9 percent shooting and is 11 of 20 (55 percent) from the line. *In his second game with Carolina since being traded by the Wild last week, Nino Niederreiter had two goals for the Hurricanes in a 7-4 victory over Edmonton.